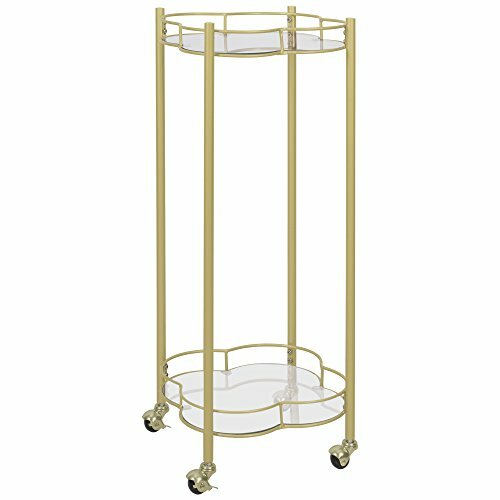 The Leona 2-Tier Quatrefoil Bar Cart is a whimsical accent that provides storage and display space for bottles, glasses, trinkets, and more. The contemporary steel frame is ideal for use as a rolling serving cart when hosting or entertaining. The locking caster wheels allow this exquisite cart to double as a side table, adding convenient function to your living space. Scaled for small spaces, the Leona is a versatile addition to the dining room, home office, bedroom, or any area in need of mobility, function, and charm. If you have any questions about this product by Silverwood, contact us by completing and submitting the form below. If you are looking for a specif part number, please include it with your message.